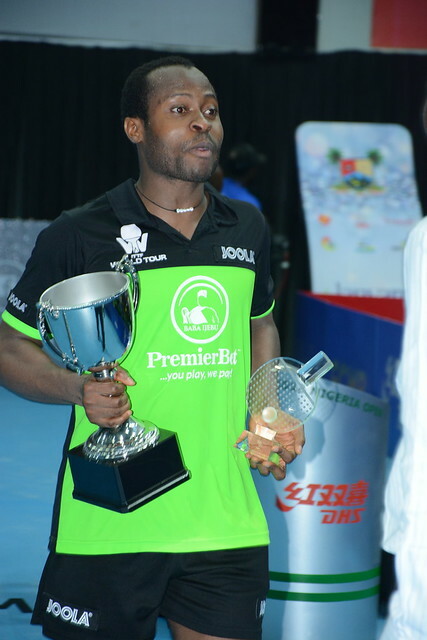 At the same side of the table, then at opposite ends, then back to co-operation; such was the lot of Fan Siqi and Guo Yan on Saturday 11th August at the 2018 ITTF Challenge Seamaster Nigeria Open in Lagos. The end result was a place in the Women’s Doubles final. In the afternoon session of play in the Sir Molade Okoya Thomas Indoor Sports Hall; not seeded, they recorded a quarter-final Women’s Doubles success against the European combination of Slovenia’s Alex Galic and Italy’s Giorgia Piccolin, the no.4 seeds (11-6, 11-5, 11-7). Success but then one hour later they parted company, they contested the Under 21 Women’s Singles final with Guo Yan prevailing in four games (11-7, 7-11, 11-8, 11-9). Adversaries but then with no time to draw breath, it was back together again for the Women’s Doubles semi-finals. In the fast lane, they beat colleagues, Wang Shu and Wei Wensheng, also not seeded, in three straight games to reserve their place in the final (11-7, 11-8, 11-6). Earlier in the counterpart quarter-final contest, Wang Shu and Wei Wensheng had overcome Russia’s Irina Ermakova and Olga Kulikova, the no.5 seeds (11-7, 11-9, 11-2). Impressive from Fan Siqi and Guo Yan; in the opposite half of the draw it was just as imposing from colleagues Qi Fenjie and Sun Chen. Likewise not seeded, they recovered from a two games to nil deficit to beat India’s Sreeja Akula and Mallika Bhandarkar, the no.8 seeds (7-11, 9-11, 11-7, 11-3, 11-5), before reserving their place in the final courtesy of success in opposition to the partnership formed by Norway’s Ilka Doval and Egypt’s Yousra Helmy, the no.3 seeds (11-1, 11-6, 11-9). In the opposite half of the draw at the quarter-final stage, Ilka Doval and Yousra Helmy had ended the hopes of Nigeria by beating qualifiers Ajoke Ojomu and Esther Oribamise (7-11, 11-8, 11-6, 11-5). The final is scheduled for 2.00 pm on Sunday 12th August.